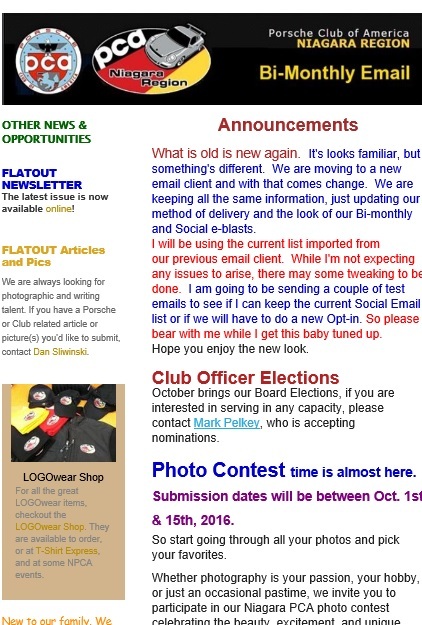 Email is a great no-cost way for our Club to stay in touch with our members and to provide timely reminders of upcoming events. It needs to be used with discretion however, as too many emails quickly become spam. Generally, emails will be broadcast on the 1st and 15th of each month. This cuts down on the number of emails broadcast and prevents filling our members’ email in-boxes. If you have something you would like included in either email, please contact our Email Coordinator. Want to get on the Niagara Region PCA email lists? On the “Membership” dropdown menu choose “Member Services” then “Member Record”. Follow the directions for making changes and click “Save”. You can also opt-out of receiving these broadcast emails by following the above directions and checking the “opt-out” option. If you are not a Niagara member, you can still subscribe to the Broadcast emails. 3. NOT RECEIVING ANY EMAILS? If you have subscribed to either list and are not receiving the emails, please check your SPAM folder. Gmail users may also wish to perform the suggestions noted HERE. Questions regarding the Niagara Region PCA email system may be directed to the Club Officers.